Finally gonna start posting some pics of my collections, starting with the smallest ones. The big ones are pretty extensive and may require multiple photos. With so many figures I won't usually name every one, but may point out some highlights. If you have any questions about any of them feel free to ask! Included Ephant Mon from Star Wars just for funsies as he is clearly based on a Platybelodon. On the right you can see the Brumm pewter flat of Deinotherium from Germany. This rare piece is at least half a century old, and is one of my favorites due to the beast inexplicably having two trunks and two tails in addition to its two tusks! I know there are other cryos out there, but for some reason I only collect the white ones. Maybe something to do with the ice and snow of Antarctica? From smallest to biggest: Yowies, Collecta, and giant Chinese Collecta knockoff (does this company have a name?). Collecta Tsingtaosaurus and the rather more flaccid Geoworld version. 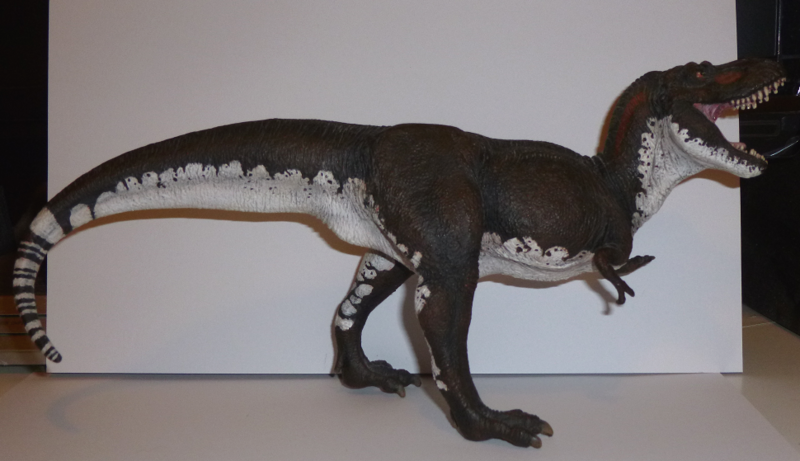 Also, the lovely Collecta Olorotitan. Would love to see more figures of this spectacular dino! Nice, thanks for sharing. But can you embed the images? Like I have done in the first post for you? The large chinasaur Ouranosaurus on the left is pretty funny. Nice! Never knew there were so many Ouranosaurs around. I think you're only missing the Starlux specimen. What company produced that large Cryolophosaurus? I'm guessing it's a knockoff of its smaller Collecta counterpart? 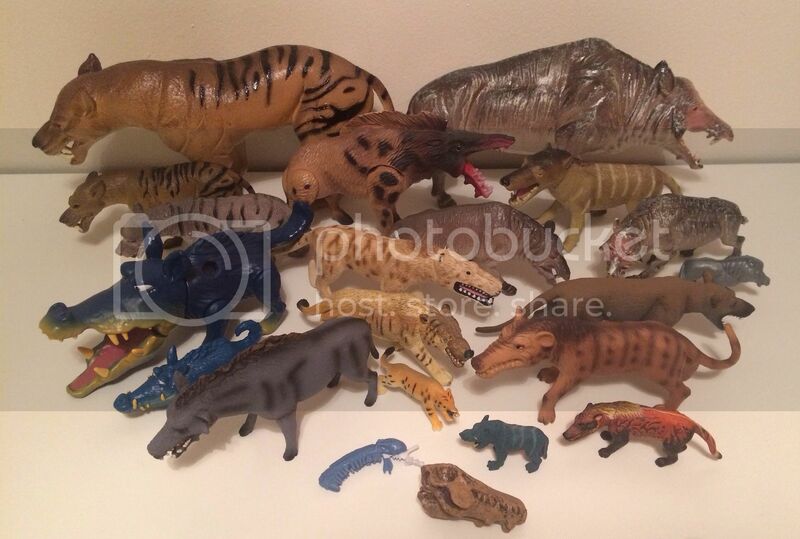 ... the Battat Ouranosaurus rules them all imo, but it's virtually unobtainable in Germany (at least for a somewhat realistic price inclduing the shipping) unfortunately.... so, what's the dark green/yellow one left of the Battat? Nice collection! Would be even cooler to look at with embedded pictures! I like the great Ephant Mon among the elephant kin! Dinotoyforum - Thank you for the helpful link! I was struggling with how to get the pics on here. I even made a photobucket account just to get them on the interwebs. The imbeds seem to have worked, so I learned something new today. More collections to come (so you can ogle the plesiosaurs)! Tyrantqueen - Isn't he though? He's a knockoff of the CollectA one, at least color-wise. Roselaar - Some Chinese knockoff company made it (they have a lot of copies of major brands, but I've not yet seen their name). The big derpy Ourano is from them as well. My apologies for owning it (I read the entire four years worth of the knockoff thread), but it rounds out the collection. Lanthanotus - That, my friend, is the infamous Salvat Ourano. Salvat Editores was a company from Spain that made knockoffs of dinos from major brands at the time (primarily Battat and Carnegie). In fact, I don't think there's a single dino in their line that's not blatantly ripped off a more successful company, and there's actually quite a few of them. In the Ouranosaurus picture, the small purplish one with the base is a Dinosaur King Maiasaura. So not an Ouranosaurus. And I don't think that big one on the right is an Ouranosaurus either. Acro - You're right, it is sold as a Maiasaura. However, it has a prominent sail on its back, thinner than the main body. When I saw it its looks just screamed "Ouranosaurus", so that's why it's included. 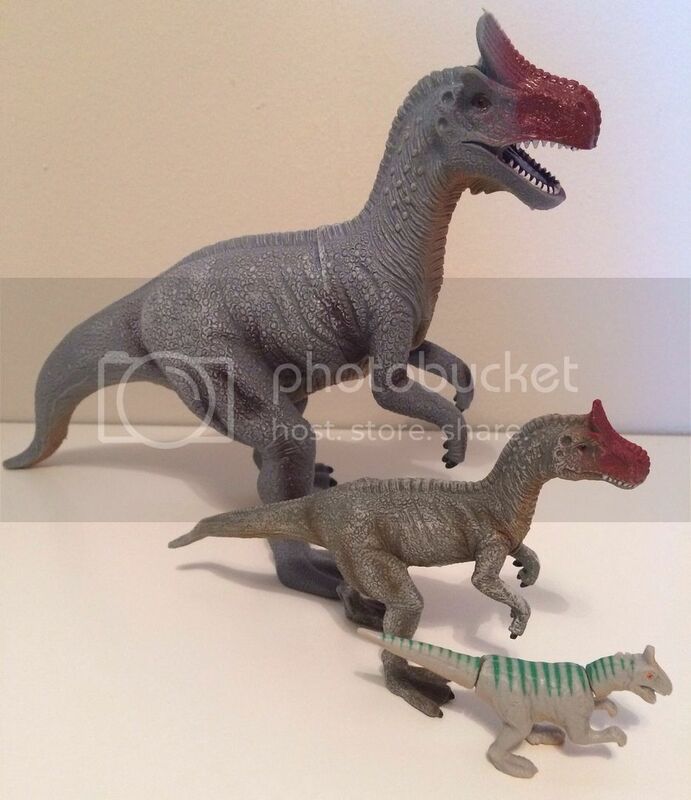 The Chinasaur-y looking one in the back was sold as a Scelidosaurus, which might be the dinosaur with the most varied depictions out there, having been presented as an ankylosaur, stegosaur and hadrosaur at various times. To me this sculpt looked like a hadrosaur with a connected fin on its back, not just a row of spikes, so I include it in my Ouranosaurs. My classification system for my collectibles can be loose, a fact perhaps nowhere more prominently displayed than in my Acrocanthosaurus collection, which is yet to be posted. For the Ouranos the criteria is basically: "Hadrosaur with a sail on its back". Next up we have my Andrewsarchus collection, expanded to include other artiodactlys like entelodonts as well as the group in which it was formerly placed - creodonts such as Hyaenodon. Prehistoric aquatic birds collection. The Hesperornis from Primeval, the rarer diorama Hesperornis from Ice Age the movie, and Yowies prehistoric penguin (Anthropornis). 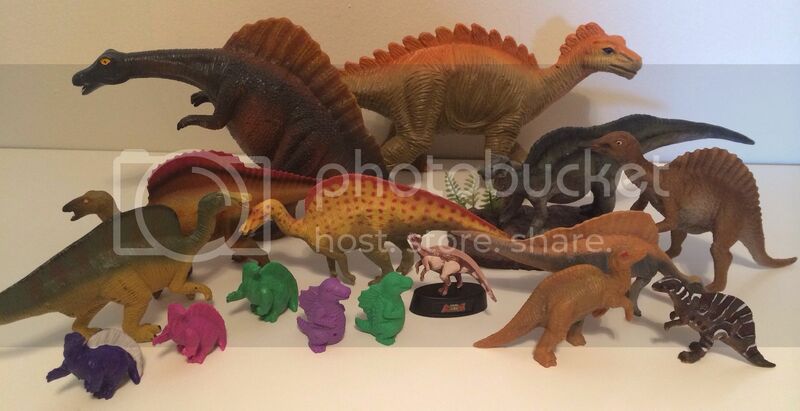 Arizonasaurus collection. Includes any quadrupedal carnivore with a long neck (distinguishing it from a Dimetrodon). 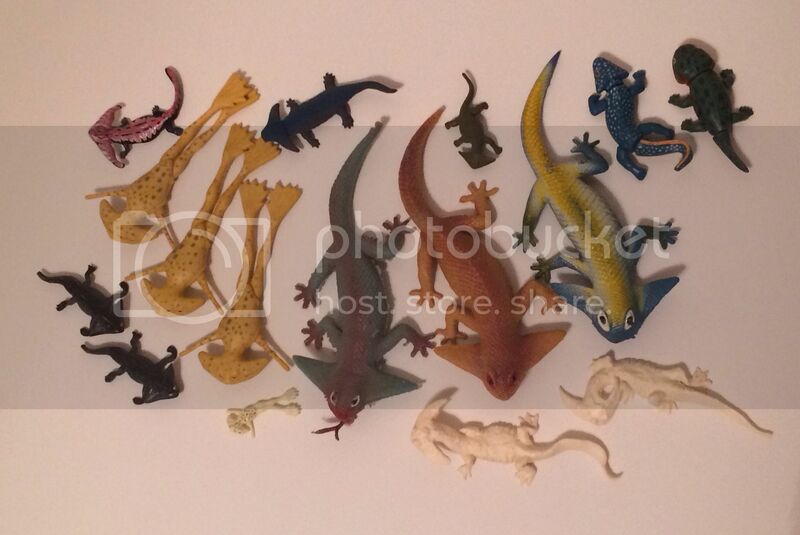 Diplocaulus collection. Includes any quadrupedal amphibian with a boomerang-shaped head. The three yellow ones with the stretched out bodies creep me out, but I don't know why. They look like aliens or something. Those stretched out ones came as a food accessory with the 12" jarjar binks figure if im not mistaken. I forgot about those lol. They look a lot like a diplocaulus! Loving your figures bluekrono, i love the vintage ones! The tyco "killer wart hog" is one of my faves! I hope to find the armor for mine. The ones with long legs and no tail are indeed Star Wars aliens, known as gorgs. If you look closely, they've even got four eyes. The big ones came with the Sebulba 12" figure. I've gotta say, the Tyco entelodont is one of my favorites as well. Even as old as it is, it is actually the closest approximation to what I believe Andrewsarchus actually looked like, hooves and all. Took years to land that one; I believe I got it from a seller in the Netherlands.